Meridian examines the progression of Dodd-Frank legislation from the Canadian perspective. Although the Dodd-Frank Act rules do not apply to most Canadian companies, we watch the slow progress of the regulations with interest as many Canadian companies follow these executive compensation rules as a matter of good compensation governance. 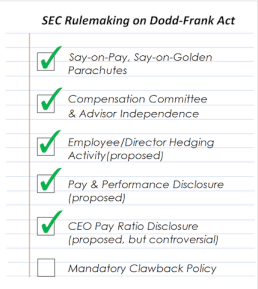 Over the past several years, the SEC has issued final rules for say on pay, say on golden parachutes, and the independence of compensation committees and their advisors. So far this year, progress has been made on rulemaking in two fronts: anti-hedging policies and pay and performance disclosures. No progress has been made on the (seemingly simple) clawback rules or the highly controversial CEO pay ratio proposed rules. In February, the SEC issued proposed rules requiring companies to disclose in their proxy statement whether any employee or board member can engage in “Hedging Transactions” for “Covered Shares”. Canadian companies are already required under securities law to disclose whether or not Named Executive Officers are prohibited from hedging shares and share based compensation. As a matter of practice, many Canadian companies extended the hedging prohibition to all insiders. The U.S. rules go further, and apply to all employees. Meridian Comment. Prohibiting hedging of all share based compensation makes sense, as the purpose of hedging is to neutralize the shareholder alignment that these awards are designed to create. However, extending the prohibition to shares held by non-insiders that are not part of a share ownership requirement seems not to have a strong rationale—often these shares are acquired voluntarily and there are no reporting requirements for shares purchased by non-insiders. In late April, the SEC issued proposed rules for a new, standardized approach for pay and performance disclosure, subject to a comment period. The rules require disclosure in the CD&A of the relationship between executive compensation “actually paid” and stock price and dividend performance. Under the proposed rules, companies disclose the relationship between executive pay and performance, using the company’s total shareholder return relative to the TSR of a peer group or index chosen by the company. The disclosure will be phased in and initially will be for the last 3 years, increasing to the last 5. Separate reporting is required for the CEO and (an average) for the other NEOs. In effect, compensation “actually paid” in these rule is similar to “realizable pay”. Meridian Comment. Currently pay and performance disclosure in Canada is voluntary and does not follow a prescribed or consistently followed format. We expect that U.S. required practices will become a generally accepted disclosure format that will be voluntarily adopted by a number of major Canadian companies. 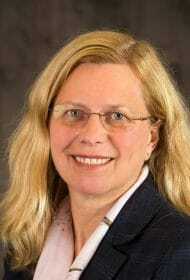 The SEC has yet to issue the proposed rules for the required “clawback” policy. The SEC has not met numerous “self-imposed” deadlines for the release of the regulations under Dodd-Frank. The latest statement by the SEC is that it intends to release clawback regulations by October, 2015, although we have no certainty that this will be the case. Many Canadian companies have been waiting for the SEC to issue proposed rules. However, an increasing number of Canadian companies have given up waiting and have introduced a clawback to help manage compensation risk and to meet ISS, Glass Lewis and shareholder expectations. The balance of companies have “double trigger” clawbacks requiring a restatement of financials and a higher incentive award than would have been made under restated financials (misconduct not a requirement). This better aligns with the double trigger clawback. Canadian companies that have a triple trigger clawback should wait for the Dodd-Frank rules before revising their policies. Those that don’t have a clawback should consider introducing a triple trigger clawback for next proxy season, if the Dodd-Frank rules are not released this fall. 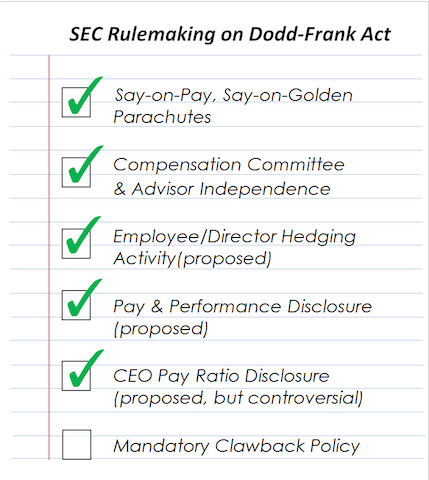 The SEC issued proposed CEO pay ratio disclosure rules in September 2013. These remain highly controversial and both sides of the debate continue to submit letters to the SEC. If the SEC adopts a final rule in 2015, then the initial CEO pay ratio disclosure may occur in 2016 proxies for the majority of public companies. Recent legislation has been introduced in the House to repeal the CEO pay ratio disclosure and although passage in the House and Senate is possible, the White House is almost certain to veto any such bill. Meridian Comment. Given the controversy around this rule, it will be interesting to see if Canadian companies adopt a voluntary disclosure practice that mimics the CEO pay ratio disclosure. However, we expect that most will take an initial ‘wait and see’ approach.